Theft is an unfortunate reality in life. People have personal possessions stolen every day. 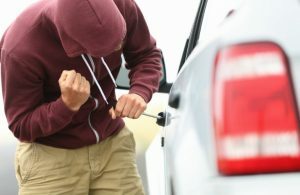 In more extreme cases, vehicles can be stolen or broken into. Your car is likely one of the most expensive things you have, so you should take every precaution necessary to keep it safe. Whether you want to protect items in your car or the car itself, we have a few tips that are worth reading. If you frequently park outside overnight or even for a couple hours when it’s dark, you should try to do so under some kind of light source. Prospective thieves and vandals will be far less likely to approach your vehicle if it is clearly visible to potential witnesses. The best option here is to totally remove valuable items from your car. They would be much more secure in your house or apartment. If, however, you insist on keeping your GPS or whatever it is in your car, be sure to place it in your glovebox where it can’t be seen. Even if someone isn’t planning to rob you, they might impulsively want to if they see a nice laptop sitting in your shotgun seat. If you live in a particularly crime-prone area, you might want to consider buying an anti-theft device. This can be a vehicle immobilizer or a camera system. A bonus of purchasing an anti-theft device is that many insurance companies offer premium discounts for cars that are equipped with one. We hope you and your vehicle stay safe and secure out there! This entry was posted on Friday, February 8th, 2019 at 7:36 pm	and is filed under Safety, Tips. You can follow any responses to this entry through the RSS 2.0 feed. Both comments and pings are currently closed.